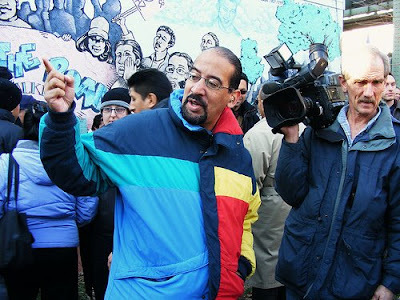 Nathan James, Author and Activist: Justicia, Si! Homofobia, No! 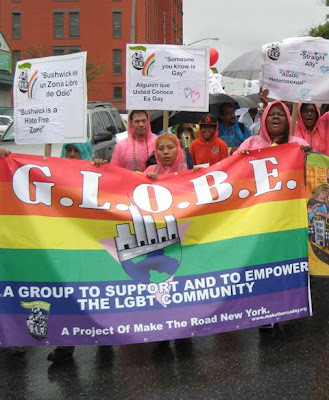 Last Saturday, I participated in the GLOBE/Make The Road NY Pride March Against Hate Crimes. The weather could not dampen our resolve to demonstrate against hate crimes that have plagued the LGBT community in Bushwick and around the city. We made our presence known so that everyone could see that we are united in our determination to free our community and society from bigotry and ignorance. Recent incidents includethe beating of two lesbians in Brooklyn by NYPD officers yelling anti-gay slursoutside a Brooklyn club, the near-fatal beating of a man thought to be gay by his attackers, recalling the murder of Jose Sucuzhanay last December in Bushwick, by two men who though he and his brother were gay. The picture below is from the Vigil and March organized by GLOBE (Gays And Lesbians Of Bushwick Empowered) in response to that horrific tragedy. I was privileged to take part in that vigil. Again, weather, in this case, the cold of winter, did not hamper our will to refute hatred and homophobia. GLOBE has been a powerful force in raising awareness of homophobia and its impact on the LGBT community and society at large. At Satuday's March, about 160 participants braved the elements (I'm in the center of the top photo, in the blue poncho) and thundered through the streets of Bushwick. I was joined by DJ Baker, Swanny River, and NYC Socialites promoter Eric Parker. Our Cry was for justice, not homophobia, for understanding, not hate, and it was a rousing success. The people of Bushwick came out of their homes and businesses along our route to encourage and support us. Justicia, Si! Homofobia, No!